BURBANK – In recognition of Asian-Pacific American Heritage Month in May, KCETLink introduces a compelling series, “Japanese American Lives,” starting Friday, May 2, on Link TV (DirecTV 375, DISH Network 9410) and Friday, May 9, on KCET. Presented by the Center for Asian American Media (CAAM) in San Francisco, “Japanese American Lives” explores the rich and diverse history of Japanese Americans with stories that go beyond the history books. From a 99-year-old female judo master, and the complex story of a Japanese immigrant family disrupted by World War II, to founders of the Asian American jazz movement, and Japanese Americans helping to rebuild Japan after the devastating tsunami and earthquake, the series is an important look at the inspirational stories of Asian Americans who have made a difference. • “Mrs. Judo” – Friday, May 2, at 7 p.m. PT on Link TV/Friday, May 9, at 9 p.m. on KCET. Using rare archival footage, exclusive interviews and plenty of on-the-mat action, director Yuriko Gamo Romer eloquently brings to life the inspiring story of a remarkable woman and judo master. At a time when women went from childhood home to wife and homemaker, Keiko Fukuda made an unpopular choice and took a different path. This hour-long documentary beautifully showcases the life of the late Fukuda Sensei (1913-2013), presenting her as not only a pioneer for women but as an inspiration to us all. • “Honor & Sacrifice” and “Don’t Lose Your Soul” – Friday, May 9, at 7 p.m. PT/Friday, May 16 at 9 p.m. on KCET. “Honor & Sacrifice” by Lucy Ostrander tells the complex story of a Japanese immigrant family ripped apart by war. The Matsumoto family included five sons — two who fought for the Americans and three who fought for the Japanese. The eldest, Hiroshi (Roy), became a hero, fighting against the Japanese with Merrill’s Marauders, an American guerrilla unit in Burma. “Don’t Lose Your Soul” by Jim Choi and Chihiro Wimbush showcases two unsung Asian Americans in the music world. his intimate portrait follows two musical legends: bassist Mark Izu and Grammy-nominated drummer Anthony Brown, both founders of the Asian American Jazz Movement. • “Stories From Tohoku” – Friday, May 16, at 7 p.m. PT on Link TV/Friday, May 23, at 9 p.m. on KCET. 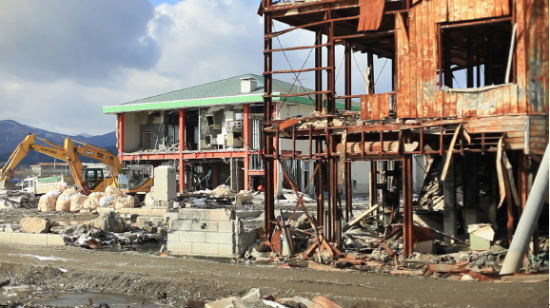 “Stories From Tohoku” chronicles survivors’ stories of courage and resilience three years after the devastating 2011 Tohoku earthquake, tsunami and nuclear disaster in Japan. This powerful documentary, featuring Olympic gold medalist Kristi Yamaguchi, explores both the endurance and frustration of survivors and the hope inspired by visitors. Told through the voices of ordinary people, we meet survivors facing an uncertain future with hope and strength, and Japanese Americans committed to help and support in Japan’s recovery. KCETLink is the national independent public transmedia organization formed by the merger between KCET and Link Media. A viewer-supported 501c(3) organization, its content is distributed nationally via satellite on DirecTV (375) and DISH (9410), in Southern and Central California via broadcast, as well as through various digital delivery systems. The combined organization reaches a wide broadcast audience that includes Link TV’s 33 million satellite subscribers and KCET’s 5.6 million households in Southern and Central California. KCETLink is committed to driving public media innovation with smarter ways to access content that engages all audiences with global storytelling. For additional information about KCETLink productions, web-exclusive content, programming schedules and community events, visit kcet.org or linktv.org.